Lent 2019 marks our tenth penitential quiz, and we are collaborating with Regent Records again to mark the occasion. 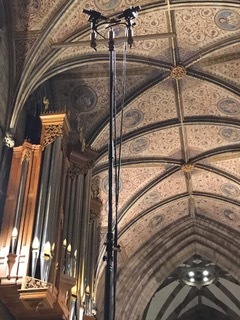 For each day of Lent (from Ash Wednesday, this year on 6 March, until Easter Eve and excluding Sunday), an audio clip of seasonal choral or organ music from Regent's catalogue will be published here at midnight. It can be accessed via the relevant link below, or via tweets and posts on our Facebook page sent out as reminders during the course of the day. The first 22 days (until Laetare Sunday) will be a single piece of music, and people simply have to identify the title of the music and its composer (or arranger): both details have to be correct for a point to be awarded. The challenge is increased for the remaining 18 days of Lent, and the clip is of two tracks combined. On the final 18 days, the titles and composers (or arrangers) of both pieces of music need to be identified; however, a mark will be awarded for each correct track, meaning the maximum possible score in the quiz will be 58. Entries will be accepted from the moment the clip appears to 23:59 on the same day. People can enter as many times as they like during the day, but only their final answer will be counted. There will be three overall winners with the highest number of correct answers; if there is a tie, the overall winners will be selected at random. Regent Records has kindly provided first, second and third prizes for the overall winners: a choice of three CDs, two CDs, and one CD from their catalogue respectively. Both daily winners and the overall winners will be named on Easter Day. Details of the winners can be found here.